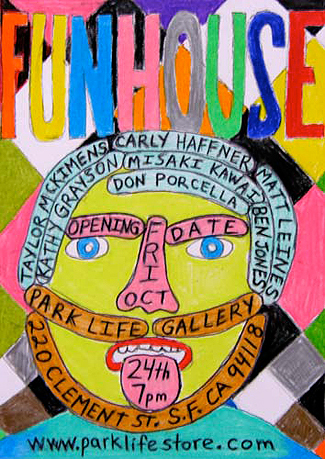 Park Life presents FUNHOUSE, a group exhibition exploring the work of 7 emerging artists that work primarily in figuration. Artist portrayal of the figure has varied from generation to generation, with each new generation establishing its own fresh voice. This group of artists leans heavily on pop culture, comics, bright colors, grotesque humor, low-fi representation and unapologetic irony. Each artist in this exhibition has created a unique vision to animate the narrative that follows. This group of New York based artists will be showing new works that include paintings, drawings and sculpture.